It’s kind of an odd fit that German automaker BMW owns quintessentially British brand Mini, as has been the case since 2000. But Mini helped BMW cover fuel economy and emissions targets with its small cars, plus it gave them some city cars. In today’s world of hybrid 3 Series sedans and relatively efficient BMW crossovers, Mini’s role is a lot less clear—especially as the current SUV and truck sales boom has left Mini’s numbers in the dust. BMW plans to launch an electric Mini in 2019. Eventually, Mini could become an entirely electric brand, aimed at urban consumers, said Peter Schwarzenbauer, a BMW board member and Mini’s boss. [...] Mini sales in the U.S. through October fell 10 percent to 38,456 vehicles, according to the Automotive News Data Center. Smart sales plunged 38 percent to 2,775 vehicles over that period. “It’s really only in the U.S. where we are facing this with Mini,” Schwarzenbauer said. 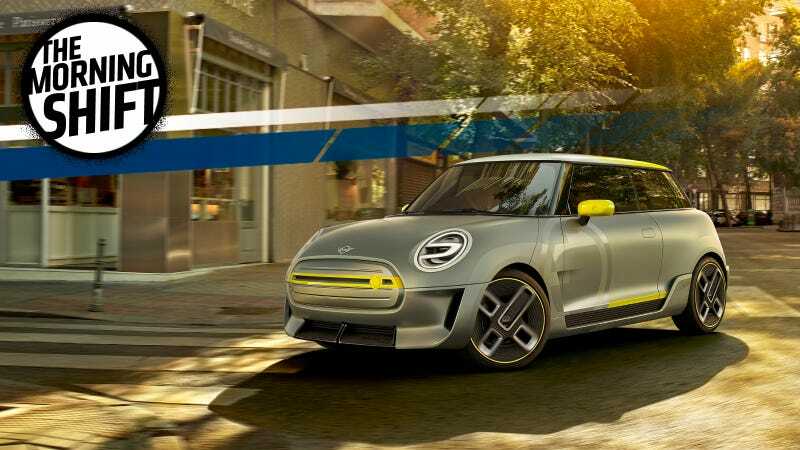 He said the way for Mini in the U.S. is to build the Mini brand “in the direction of the electric urban mobility company” rather than adding larger SUVs. Currently, packaging is a major hold-up, as BMW is seeking partners to help fit everything that’s needed for an electric car to have decent range into its small cars. Making small cars electric to give them a trendy angle for the U.S. market is a strategy Daimler is trying out with its Smart brand, so Mini would essentially be following their lead. American consumers are buying bigger SUVs and trucks at the moment, as gas is cheap and nobody seems to remember that gas prices fluctuate around here. Minis aren’t as small as Smarts, though, and haven’t seen as sharp a sales drop. Even the littlest base model can be a decent road-trip car out of the city, so I’m not sure I’m on board with this all-electric idea just yet. If we had better infrastructure outside of major cities for EVs, maybe. But not yet. A criminal probe of Uber Technologies Inc. has turned up evidence that the ride-hailing company used encrypted messaging to hide its tracks while spying on rivals, evading authorities and fighting off lawsuits. “I can no longer trust the words of the lawyers for Uber in this case,” the visibly angry judge said in court. “If even half of what is in that letter is true, it would be an injustice for Waymo to go to trial.” Alsup had referred the lawsuit for a criminal probe in May. Jacobs’ letter suggests that the reason why documents that were allegedly stolen by Anthony Levandowski from Google’s self-driving car division Waymo weren’t found on Uber’s servers is through the use of these disappearing messaging services. Oops! Peugeot-makers PSA Group want about half of the $1.5 billion it paid General Motors to take Opel off their desperate hands after learning the full extent of Opel’s carbon dioxide emissions issues, Reuters reports. The problems could result in hefty fines from European authorities which could be as high as $1.2 billion when new emissions regulations phase in starting in 2020, which PSA would now be on the hook for. Among the unpleasant surprises was a CO2 compliance plan that relied on significant sales of the Opel Ampera-e electric car, a U.S. import based on GM’s Chevrolet Bolt, at a loss approaching 10,000 euros per vehicle, two sources said. Under PSA, Opel has already suspended Norwegian sales of the Ampera-e - which account for most of the model’s 1,500 deliveries to date - and increased European pricing by as much as 5,700 euros. Without the economically unviable Ampera-e, Opel’s existing technology won’t meet tough new European Union emissions standards, and PSA believes they’ll now have to move its own fuel-efficient technology into Opel cars earlier than planned at great cost to the company. Opel is seeking somewhere between $710-949 million from GM in a legal claim over the issue, according to one source who spoke with Reuters. However, PSA has yet to initiate that claim at this time. To their credit, GM CEO Mary Barra spoke of “increasing regulatory and compliance costs” as a reason they were selling Opel and its sister brand Vauxhall. However, it sounds like PSA may not have known the full extent of those challenges, and GM has already had to pay over $6 billion to leave Opel and Vauxhall behind. Volvo and Geely may choose to build their new Lynk & Co. vehicles in Charleston, South Carolina, and Gent, Belgium, Reuters reports. Sales of the new brand, which is owned jointly by Geely and Volvo, started Tuesday in China and are expected to start in 2019 in Europe and 2020 in the United States. The start of Lynk & Co sales caps a decade of preparation by Geely to improve its prospects in a local marketplace dominated by global automakers, and expand abroad. To that end, Geely’s founder and chairman, Li Shufu, bought Volvo Cars in 2010, giving it access to Volvo’s engineering know-how. The first model, the 01 sport utility vehicle, is being built alongside the Volvo XC40 in China. Likewise, they’re thinking about building Lynk & Co. vehicles at existing Volvo plants in Europe and the United States. Volvo’s South Carolina plant is still under construction, but is one of the sites being considered. Lynk & Co. is sort of a test bed for both companies to dabble in online sales, a limited dealer network and subscription models. Like Mini, the company is mulling over the idea of only bringing its electric and hybrid models to the U.S. and Europe, Reuters notes. The company hopes to sell half a million cars in China, the U.S. and Europe by 2021. If Britain opts for a “hard” Brexit—the most severe cutting-off of its ties to the European Union—Ford says that they could lose up to $1 billion in tariffs, reports Automotive News. As a result of all the uncertainty surrounding Brexit, they’re reconsidering their investment in the United Kingdom. Ford of Europe President Steven Armstrong said it would be “disastrous” if Britain leaves the European Union without a trade deal. If the UK doesn’t remain competitive, Ford could rethink its plans to invest in Britain, Armstrong told Channel 4 News. Armstrong’s warning came as the UK’s auto industry body issued a stark warning to the government’s business minister that introducing friction to trade with the EU could undo decades of work spent honing world-class manufacturing. World Trade Association tariffs would add at least 4.5 billion pounds ($6 billion) to the industry’s annual costs, the SMMT said in a statement Tuesday. More than 1,100 trucks deliver auto parts to UK factories every day and currently benefit from free passage across borders. Further meetings over Brexit between U.K. Prime Minister Theresa May and her European counterparts are scheduled before the end of the year. Reverse: Racketeering And Industrial Espionage At Volkswagen, Who’d Have Thought? Neutral: Yea Or Nay On Electric Mini? Minis may have gotten bigger over the years but most of them are extraordinarily fun. We’d be a bit sad to see the gas engines go away. Is electric the way forward for this troubled brand?